I’m in another Chicken Soup for the Soul book! This one is called My Kind (of) America, and it’s all about people being kind to each other—something that we need a heck of a lot more of these days. Unlike last time, I didn’t write about Lilo, who is known for many endearing traits, but not kindness. As for me, “nice” is probably the last adjective that would pop into most people’s heads, so I didn’t write about myself either. But that’s okay, because I know a lot of people who do a lot better in that department, so I still had material to work with. My essay is about how someone’s extreme generosity surprised me when I moved into a place of my own for the first time. 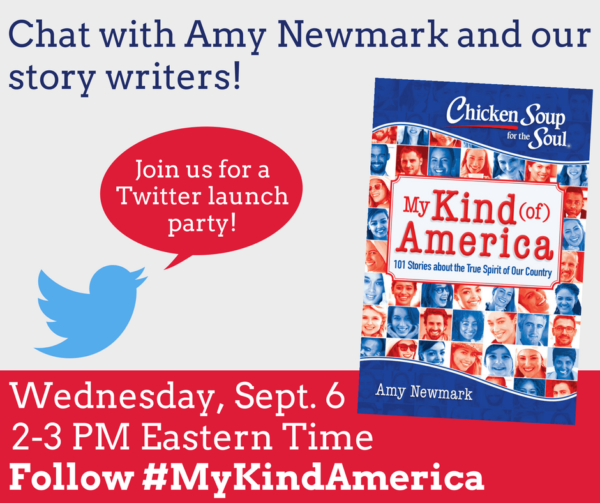 The writers and editors of My Kind (of) America are having a Twitter party tomorrow from 2–3 pm Eastern (1–2 Central; noon–1 Mountain; 11–noon Pacific), and if you’re on Twitter, you’re welcome to join us with your own story of kindness by tagging your tweet with #MyKindAmerica. If you’d like a signed copy of the book, contact me at contact@seasonofplenty.com to order. Congratulations, Kathryn. I enjoyed your sweet story! Thanks so much! Are you in it too? I haven't had a chance to read it yet lol. Maybe I should do one each morning. That would be a good way to start the day!